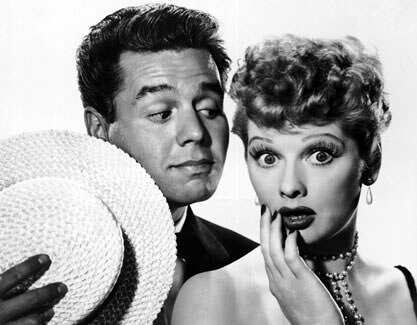 I grew up watching I Love Lucy. Of course, every home did not have a television set but it helped that my Dad sold TV’s at his butane business in my small Mississippi hometown of Hazlehurst. He always boasted that we had the first color TV in Hazlehurst. I don’t know this for a fact but I do know my little face was glued to that TV set for as many hours as my parents would let me watch. And my favorite show was I Love Lucy. I still watch every re-run I can catch. It takes me back to a time when life was less complicated, wholesome and somehow, a slower pace. It calms me down. Lucy made you laugh when you were sad and happier when you were happy. Luck? I don’t know anything about luck. I’ve never banked on it and I’m afraid of people who do. Luck to me is something else: Hard work – and realizing what is opportunity and what isn’t. 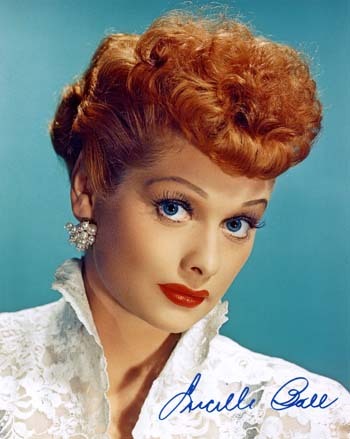 Happy Birthday, Lucy!! I still love you! 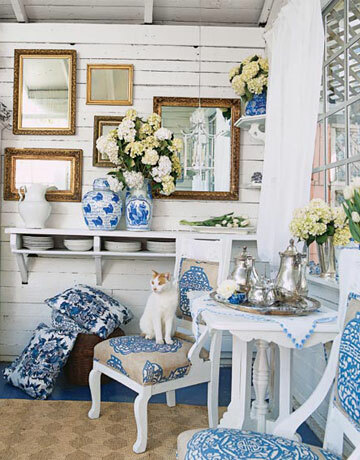 I read about Pets and Designer Rooms over at Better Homes and Gardens. I am a pet lover and truly believe you cannot have a real home without a pet. 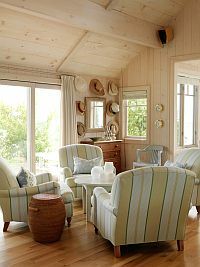 Take a look at all the rooms at the link above. 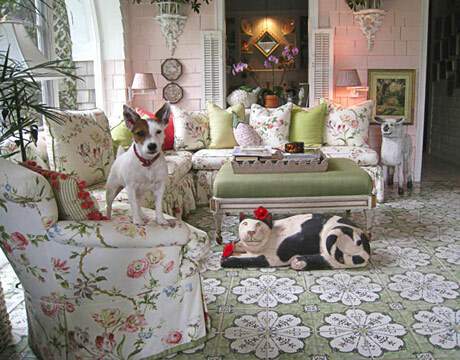 Here’s a pooch sitting on a chintz chair..
and, of course, we can’t forget those cute felines. Here’s China the Cat with Ming fabric. I was wishing for the taste of a homegrown garden tomato? Well, now I have tomatoes GALORE and am loving it. This year I only planted those nice big ones.. Big Boys and Better Boys.. where one slice will just about cover a sandwich. Nothing better than the distinctive taste of a ripe tomato, still warm from the sun, with a little salt and mayo on bread. Bacon and lettuce are nice but I like the simplicity of just the tomato. The only problem is they are all getting ripe at the same time and am wondering what to do with all this homegrown produce. The weather is too hot to do much canning. I really need some easy solutions to save these rare treats. Help me out here.. What is your favorite ways to use an abundance of tomatoes? You know how it goes. 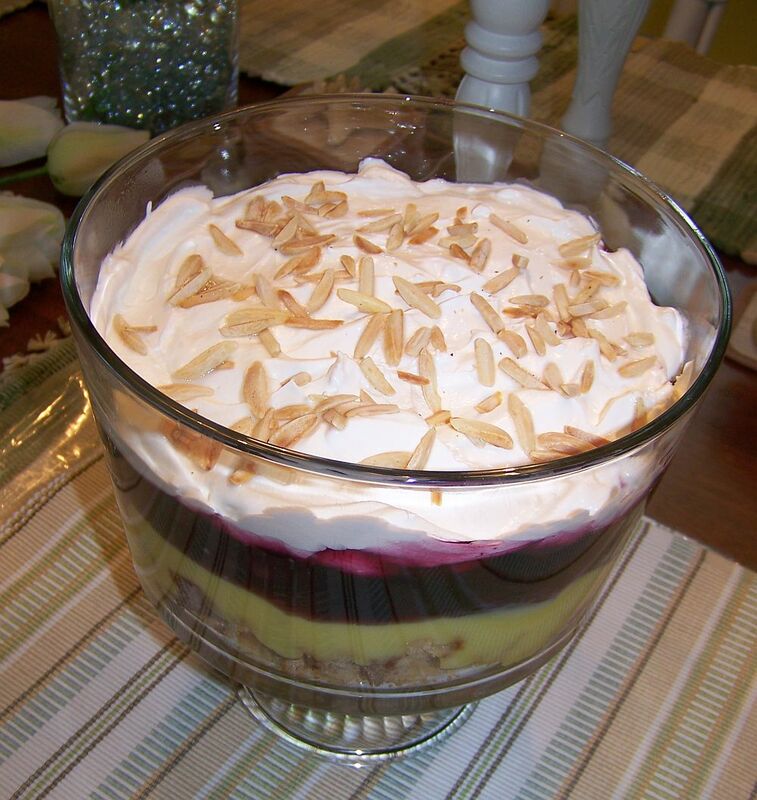 You have all the ingredients together, all set to whip up a great dessert for the July 4th Holiday, and time gets in the way. By the time shopping, packing, traveling, unpacking, and cleaning was done at the lake camp on Friday, there was no time for preparing the dessert before the guests were arriving. Saturday morning rolls around.. should be plenty of time to whip it up now… no, not a chance. Between fixing breakfast and making snacks for the day on the lake, it was just not in the plan. Never fear, though. 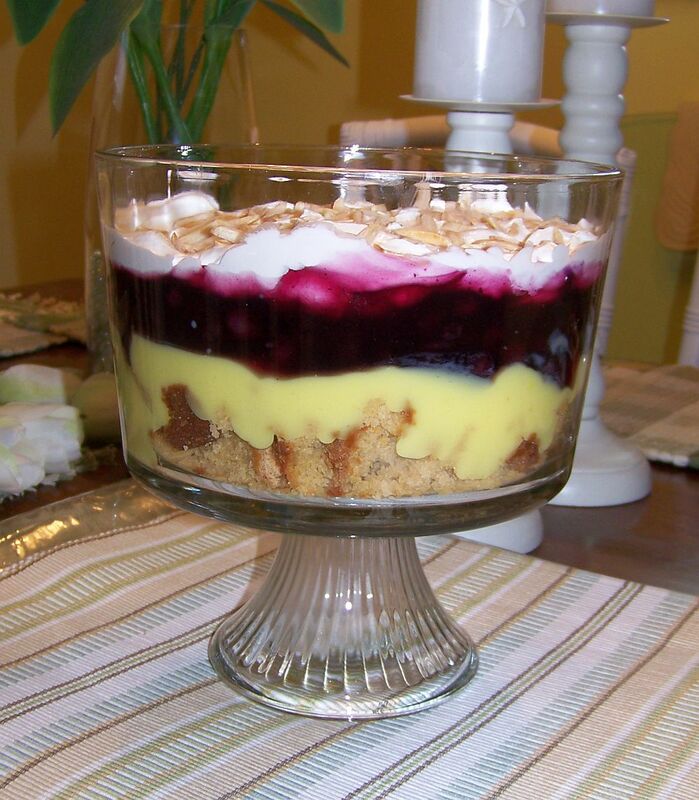 Two days after July 4th..drum roll, please.. we have our Lemon Blueberry Trifle. Cube the cake and place in bottom of a 2 quart bowl. Mix the pudding according to directions and pour over cake. Spoon pie filling on as next layer. Cover with Cool Whip and sprinkle on the nuts. Keep refrigerated. May try variation: use chocolate pudding and cherry pie filling. Have to watch my Food Network shows on Sunday morning and Rachel Ray had this Greek Green Pastitsio recipe that sounds delicious. Simple enough to prepare and healthy with its chard for a green veggie. One reviewer says the mint and dill make it perfectly seasoned. I think anything with feta cheese will stand out. 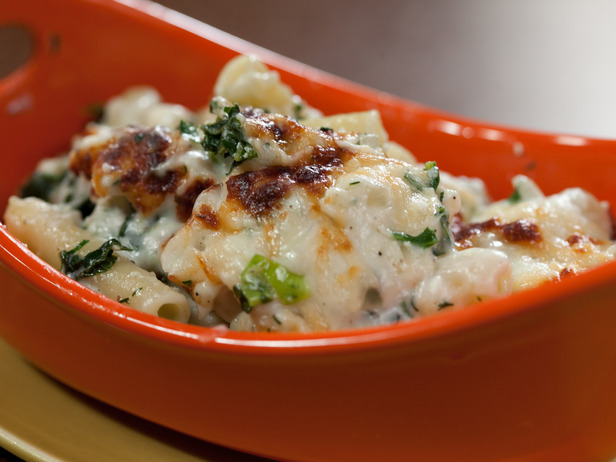 Another reviewer said it is a perfect Greek Mac n Cheese. Can’t wait to try it.. For the full recipe, click Rachel Ray’s Green Pastitsio recipe page here. Father’s Day Weekend involved a trip to Kentucky Lake where my friend and excellent cook, Paul, had cooked up the perfect Friday night summer supper. 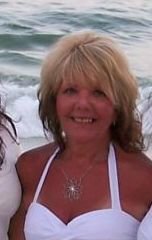 This Mississippi transplant, turned into a Southern Illinois Yankee Lady, is still use to plain Southern cooking, so it is always a delight to see what’s cooking at Paul’s house. If you have never tasted the distinctive flavor of an artichoke, then you are in for a treat. There is very little preparation involved in serving it this way except for trimming the top and boiling in salted water for about 30 minutes. The trick is in knowing how to eat it which I was taught this weekend. Each leaf has a tender meaty tip at the end. Just tear the leaf off and dip it in a sauce such as this lemon butter dip seen here and scrape the very end with your teeth to enjoy the meaty flavor. As you get down to the center, the leaves become a little more tender and more can be eaten than just the tip. The best part, of course, is the “heart.” Use a knife to remove the spiny tendrils at the top and then dig in for some fancy eating! The next course was a fresh California Chicken Salad atop Romaine lettuce leaves with ripe tomatoes. The chicken with its green grapes and toasted slivered almonds was served with a curry mayonaise. This was possibly the most delicious chicken salad I have ever eaten! Yummy!! We call him “The Cook” and he is certainly a fantastic one. It’s his hobby but he could open his own restaurant. Thanks, Paul, for another meal and a refreshing summer supper and by the way… Happy Father’s Day.